Battle your friends in space... then run over their pilots! The Switch eShop is currently on a bit of a roll with interesting weekly releases. Up on 30th May you'll be able to give Astro Duel Deluxe a spin; it's $14.99USD in North America and £12.59 in the UK. 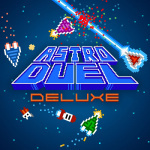 Having first appeared as Astro Duel at the start of 2016 on Steam, this deluxe version offers a range of improvements including new modes and support for 6 players rather than just 4. The action takes place as a local multiplayer party game, which sounds perfect for the Switch with the range of control options at your disposal. The gameplay looks like Asteroids, which takes place in dynamic areas offering both hiding places and hazards. Are you interested in picking this one up next week? I'm not even joking this excuse for lack of funds called "retro" is starting to get tiresome personally. I want to see unique games not games that have been around for 30 years. 15€ for this game? there's much better choices in e-shop. Sometimes I think this indie developers overprice their products too much. Looks great ! I agree that 15$ is a bit steep. The tenner it is charged on Steam would make more sense to me... but depending on the reviews I might dive in. Local!? Dammit! I don't know 6 people who'd be willing to sit down and play this with me, Nintendo! I don't have 6 siblings! I don't have 6 cousins, nieces or nephews! I don't have 6 best friends! (Just 2. The rest are filthy casuals who don't even like video games at all D8) and anyone else I've left out only plays games on their PS4/Xbone or simply doesn't play games anymore. This I'm not too interested in - not a fan of Asteroids. Although that looks like a nice retro title, those people in the trailer seem like they have gone crazy. I like the look of this play style but why all so Retro visuals? @timoneiro_feup Maybe not relevant for the Switch eShop, but a lot of indie developers do purposefully overprice their games. The reason being, most people don't even think about buying them until they're in the sales. If an indie prices their game at what they think is a fair price, but the majority of sales occur at a 30%, 50% or even 70% discount, their revenue becomes severely stunted. As I say, we've had basically no sales on the Switch eShop thus far, so it really makes no sense for this game to be as expensive as it is. Looks nowhere near interesting enough to purchase. Around £5 would give it the kind of impulse buy appeal that has lead to Kamiko staying in the charts for so long. @VENOMVSCARNAGE $15 converts to about £11.50. Hardly cheaper. Plus, don't you then have to add on tax? Roots in what is probably the very first video game: Spacewar! (1962). It was a crazy hit back then with many iterations and mods on computers only small number of people in the world could even access. In IBM it was considered a serious threat to productivity. Retro visuals seem appropriate especially when realistic visuals would add nothing. Maybe something a bit sharper but abstract would be fine but anything realistic would just be hard to follow. Trailer is funny and genuine and if you haven't had local multiplayer sessions like that you really need to get some gaming buddies. One benefit of the retro graphics is they can be less intimidating and get some traditionally non-gamers to join in for something silly and not to be taken too seriously. For those worried about online I did see a couple reviews on Steam that suggested single player wasn't bad. Really, though, this is obviously for local multiplayer. Would be cool if they had online. Will check it out, but I'm not going to lie, $10 would be easier. Already need to get more use out of Bomberman even though the experiences we've had were awesome fun (sort of like the people in this trailer but with less profanity ). @aaronsullivan This isn't retro, this is ugly. I think many observers fail to account for basic tastes in gaming when regarding prices. Just look at the comments here where you have people that don't value the local multiplayer experience this game is clearly aimed at vs. those who do. Of course it is priced too high for those who don't value that. That doesn't make it "overpriced". Plus, the characterization of indie developers, many of which will never, ever break even and just complete projects out of passion as "overpricing" their games on purpose because of sales coming later is just insulting. With such a huge glut of choice and free, ad-supported options everywhere, pricing and monetizing is a nightmare for publishers, and much worse for indie developers. @Tetsuro I'd say it's both. For this type of game, beauty would hopefully be found in the experience. No single player means it wouldn't be worth it for the few minutes I'd spend playing this with friends instead of something more fun like Puyo Tetris or Mario Kart, and I probably wouldn't pay more than $5 for this even if it did have single player. Reminds me of that one battletoads and doable dragon section. With the difference that it looked better and the music was good. Deluxe? I'll be getting it. Looks like fun. The Steam version seems to have good reviews too. I like the look of the gameplay but the graphics are awful! @tjhiphop yeah I get what you mean. These games normally have huge sales after some time, but I think that works in stores like Steam or PS4, where indie games have little or even any notice when launched and are only featured when in sales. This looks awesome! Gonna pick this up for sure. Oh. What was I worried about? Lol. I just got home and finally got to take a look at the video. Needless to say - I was not impressed with the gameplay, nor the way it was delivered. I wont be picking this one up afterall.